While the imposition of the LTCG is a negative overall, this does not really alter the fundamentals of the market, which would focus more towards improvement in the core earnings trajectory of corporates in India. The much-awaited Union Budget for FY19 focussed on the themes of rural development, improvement of the agricultural economy and promoting Make in India. Accordingly, allocations have risen for rural, agriculture, healthcare and education sectors. To boost rural incomes, the government has also proposed fixing the minimum support price (MSP) for all summer (kharif) crops at a minimum of 1.5x the cost incurred by the farmer. All efforts will be made to ensure that if market prices fall below the MSP, the farmers should get a price closer to the MSP. The continued thrust of government policy has been towards removing the middleman and helping the farmer reap the benefits of higher productivity. Apart from rural and agriculture spend, the thrust on infrastructure development continues with increased spend on roads and railways. One of the key thrust areas of the Budget this time around has been ‘Make in India’. With the implementation of GST, the excise duty changes were outside the ambit of the Budget 2018. However, there is a significant support for “Make in India” in terms of increase in custom duties in select products. The products have also been selected, where Indian industry already has or can develop manufacturing capacities in reasonably short time. Custom duty increase is aimed mainly to benefit consumer electronic manufacturing (mobiles & TV), agricultural processing (fruit juices, edible oils and other processed foods) and automobiles. 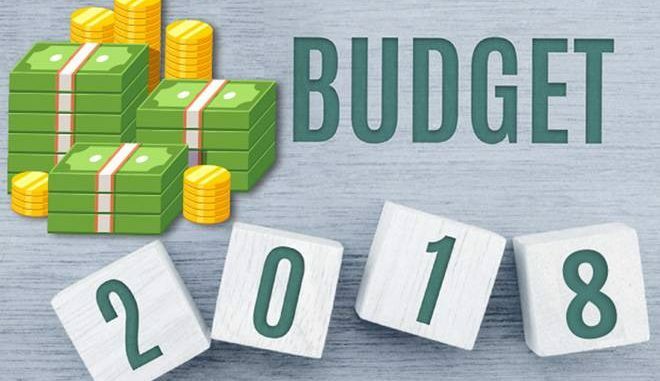 The budget also tries to spur indigenous industries and small and medium enterprises (SMEs) through the reduction in corporate tax rate to 25 percent for companies with turnover of up to Rs 250 crore. The government announced a national healthcare scheme that will cover an estimated 10 crore families and would provide Rs 5 lakh per family per year. Post the fairly successful implementation of the crop insurance scheme last year, this bodes well towards providing health insurance for a large part of the Indian population. Though currently many of the private players have been vacating the government health insurance space, it is likely that the scheme would generate fresh interest in the segment. The budget while deviating from fiscal consolidation in the near term does seek to move back to the path of fiscal prudence over the medium term. Overall the budget tries to strike a midway between fiscal prudence and the needs of the economy. The more important takeaway is that this increased borrowing is not being wasted on populism and freebies, but going towards more productive infrastructure creation. The commitment to long-term fiscal consolidation has been outlined in the budget. While, the fiscal deficit target is set at 3.3 percent of GDP for FY19E, the path towards reaching 3 percent fiscal deficit by 2021 has been outlined. One of the biggest benefits of GST implementation is expected to be an improvement in tax compliance. This is reflected in the expectation that the budget sets out for improvement in gross tax/GDP ratio from 11.6 percent in FY18 to 12.7 percent in FY21E. The imposition of long term capital gains (LTCG) tax of 10 percent (without indexation) on equity markets and equity mutual fund units is a negative for market sentiments. The impact, however, would be contained due to the grandfathering clause, which exempts long-term capital gains on purchases up to January 31, 2018. Finally, the budget points towards the need to develop the corporate bond market in India. While there are no concrete steps announced in the budget, SEBI would mull over the proposal of asking large companies to raise 25 percent of their debt requirements from the debt markets. Further, some of the tax-related hurdles relating to resolution of debt of companies referred to NCLT (National Company Law Tribunal) under the bankruptcy code have been resolved. This would finally pave the way for resolution of large corporate debt and help many of the corporate banks clean up their balance sheets. Disclaimer: The author is Senior Vice President and Head of Equity Research, Kotak Mahindra Asset Management Company (KMAMC). The views and investment tips expressed by investment expert on moneycontrol.com are his own and not that of the website or its management. Moneycontrol.com advises users to check with certified experts before taking any investment decisions.